From cloud access points through to using personal devices in the workplace, tune in for frank insights into what you need to be most worried about in 2012. ESG recently conducted research around insider threats, privileged users and APTs. While the security community remains fixated on advanced malware, tried-and-true insider threats are becoming more difficult to detect and prevent. Join us for this must attend webcast to learn how privileged users can get their jobs done - without viewing or compromising data. When an outside party owns, controls, and manages infrastructure and computational resources, how can you be assured that sensitive data remains private and secure, that your organisation is protected from damaging data breaches, and that you can still satisfy the full range of reporting, compliance and regulatory requirements? * How to proactively address security in the cloud so that your organisation isn't next week's data breach headline. * How to protect intellectual property and comply with data privacy and system integrity regulations. * How to combine context-aware user access, high performance encryption for data-at-rest and operational control into a single system that seamlessly interacts with existing IT systems. File sharing whether on a PC or mobile makes workers more productive, that's undebatable, but what does an effective enterprise file sharing platform actually look like? More importantly what will it look like in 10 years time? Tune into this upcoming SC Magazine webcast to hear from Clive Longbottom, Founder at Quocirca, Accellion - a top ranked Enterprise File Sharing & Sync supplier according to Gartner, as well as further to be confirmed industry experts. * What policies you should have in place. An evaluation and dissection of SC Magazine survey: Security beyond the corporate LAN. This webcast is essential viewing for all information security professionals who need to keep up to date with advancements and trends in threats to data outside the corporate network. New threats emerge daily, sometimes hourly. But how often are you assessing network vulnerabilities? If it’s less than daily, is your vulnerability management program really protecting your organisation from attacks? Or is it merely a compliance checkbox for auditors? How often can you claim to know exactly how vulnerable you are, and in turn what to do about those vulnerabilities? Only 22% of data breaches are as a result of an external attack on corporate servers . In the vast majority of cases, breaches involve the inadvertent mishandling of information by insiders or third party partners. For example: a confidential document is accidentally sent to the wrong person, an employee drops files into a consumer-grade file sharing solution to access them on holiday, or an organisation terminates a relationship with a partner or supplier after having shared proprietary information with them. Enabling your staff to work remotely, on a multitude of devices, and on unsecured networks is essential for many 21st century businesses. However, such a model also has very specific risks, particularly for financial services, life sciences and other IP-intensive industries. This webcast addresses the technological challenges of maintaining full control of your most sensitive information - even once it goes beyond the firewall - while maintaining the freedom and flexibility necessary to allow your staff and other stakeholders to work as efficiently as possible. In a recent SC survey, when asked ‘Do you think your current network is secure?’ 43% of IS professionals said Not Sure. At first glance, this appears a surprisingly high figure – but a closer look at today’s threat matrix soon tells us why. Technology developments such as multi-point cloud solutions, consumerisation, BYOD uptake and even Windows 8 are a major headache in network security for IT leaders. Plus organisations face a growing number of ‘invisible threats’ that they are often not aware of, and which present a very real risk to corporate security. So what can be done to identify, monitor, respond and report these network security threats in real time? In a recent SC Survey of information security professionals 99% of those asked said it was ‘important’ that their organisation has secure file sharing. But 50% said they had ‘no real visibility’ of how data is being sent within and outside the company. If IT professionals – who know the risks – are prepared to use such systems, what are employees not versed in security prepared to do? Tune in to hear our experts discuss these and the other quite surprising results, plus a look at how best to protect files shared inside and outside your organisation, while benefiting from the productivity boost such sharing can allow. With SC’s annual conference taking place later in the year, we have invited some of the speakers to run the rule over a few of the key human factors affecting information security risk. •Where do human factors rank in relation to other security risks? •Is it feasible to identify key human risk factors and if so, how can they be successfully integrated into an IT risk matrix? •Is it true that people value the security of data differently to tangible goods? If so, what can be done to change perceptions? •To what extent is IT security seen as a board level issue - what steps can be taken to effectively communicate IT risk to the Board? •Spread the love – or at least, the message. Why do staff consistently ignore IT security messages and what can you do, to hit the message home? It has been a year since the European Commission (EC) published the first draft of its updated data protection law but critics have claimed the regulation is overly prescriptive and out of touch with the rapid change in digital communication (SC Magazine Online, January 2013). - Ask why the same data protection breaches stemming from human error are still being made, and what can we do about it? - With data breaches continually on the rise due to BYOD, cloud platforms and social networks setting such a furious pace of change - what does the rest of 2013 hold in terms of staying compliant and ultimately keeping your data protected? On January 1st EC3 (The European Cyber Crime Centre) opened it's doors at Europol. This signifies the start of European regulators taking a structured approach to cyber security. Breach reporting obligations are undoubtedly going to become a reality for more and more as what's considered 'critical infrastructure' is redefined. * What new legal frameworks can be expected in 2013? * Will this lead to a deluge of fines, like that received by Sony in mid January? * How do you engage with a regulator after a data breach? With the growth in BYOD, remote working, and SaaS, the challenge of actually identifying who is accessing your systems has grown exponentially. SC Magazine has invited Andrew Yeomans and Paul Simmonds, both founding members of the Jericho Forum, to discuss this issue in detail. * What’s changed in recent times, and what should you expect in the next 18 months? Tuning in is essential for any information security professional worried about identity management. And if you're not worried, you should be. 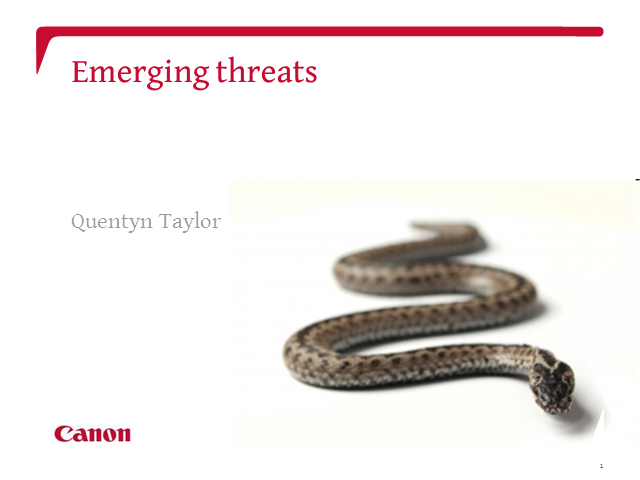 The threats you face are dictated by the type of organisation you work for. UNICEF is unlikely to face an attack from Anonymous, but this doesn't mean they're safe from everyone. What cyber security threats should be on everyone's radar this year? * New laws and regulations? Tune in to hear what's on top of the list for this years key security threats. The value of the information security industry is predicted to reach $71bn by 2014 (or roughly $10 for every man woman and child alive). However, many IS professionals still find their departments lacking time and resources. - How to save time by streamlining installation and administration processes. - How to successfully secure further funding by demonstrating in simple terms why your role is BUSINESS CRITICAL. - Best practices for efficient incident response. The ICO (Information Commissioners Office) recently clarified its guidance for securing data in the cloud under the UK Data Protection Act. This served as a reminder that organisations can shift responsibility but not accountability in protecting personal information in cloud applications. What does every IT professional need to know? Don’t miss this informative webcast! * How the database threat landscape has changed and what’s coming in 2013? *** What threats should you be monitoring and why should you be monitoring them? **** Encryption techniques that ensures any stolen data are totally worthless. * How they fully protected corporate infrastructure and data. - Can mobile devices truly provide a secure personal identification method? - How would such a strategy fit with BYOD programmes already in place? - What are the limits, and what could is likely to happen in the future? The weaponisation of software has ushered in a new era of cyber attacks. But with 99% of organisations not prepared for this new front line of cyber-warfare, what does this spell for your business? - What data protection obligations are actually in place internationally, and why are they there? - Staff, systems or superiors – who is actually liable in the event of a data loss? SC Insight's webcasts feature the leading speakers in the marketplace and address your key challenges. Sign up to this channel to receive groundbreaking insights into the hottest issues within information security. You can also take part in our votes, put your questions to our live experts and submit your feedback.